This course will provide understanding and assistance to teachers working with Attention Deficit/Hyperactive Disorder (ADHD) and Learn Disabilities (LD) students. Educators will be able to define and diagnose students with commonly used assessment instruments. Understandings of the legal requirements are presented along with developing IEP's and Section 504 plans. Student self-management and behavior interventions are explained. 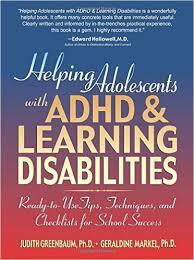 Teachers will understand the role of medication and addressing gifted ADHD or LD students. Teachers will write chapter and video reviews and develop a project/activity showing how the information in the book can be utilized in schools and classrooms. Educators will have a working knowledge about the specific definitions and spectrum ofproblems that students with ADHD and Learning Disabilities may have. Participants will be able to understand the legal requirements and main laws dealing withstudent disabilities and the underlying premises of IDEA and section 504 plans. Educators will view a video, write an essay or develop lesson or unit plans utilizing the information in the book for classroom and school applications.